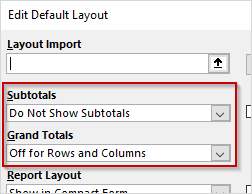 As part of this month’s update, a new Excel feature gives you the ability to personalize the default layout for your PivotTables. Enabling users to personalize the PivotTable defaults started as a feature request in our Excel UserVoice forum. Now, when you’re building complex reports or performing one-off analyses, you can quickly get started with your favorite PivotTable layout. This feature is available for Excel 2016 on Windows as part of an Office 365 subscription. 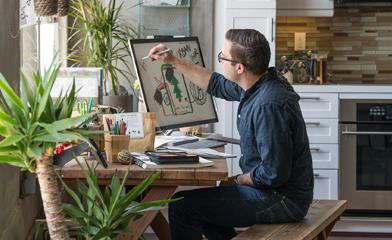 If you are already an Office 365 subscriber, find out how to get the latest update. This month, we also included a tip when using OLAP connections to make your PivotTables much faster. Read on to learn more. 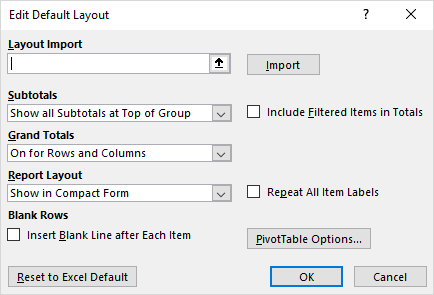 There are two ways you can adjust the layout settings for the PivotTable defaults. One way is to simply click the newly added Edit Default Layout button under the File -> Options menu to display the Edit Default Layout dialog. Here you can make changes to many of your favorite layout options. Included are all the settings in the “Layout” chunk of the PivotTable Design contextual ribbon. We also included all the settings in the PivotTable Options dialog. To learn more about how you can use this new feature, visit our support page. If you have any suggestions for a new feature you would like to see in Excel, head over to the UserVoice forum and become a part of the conversation!